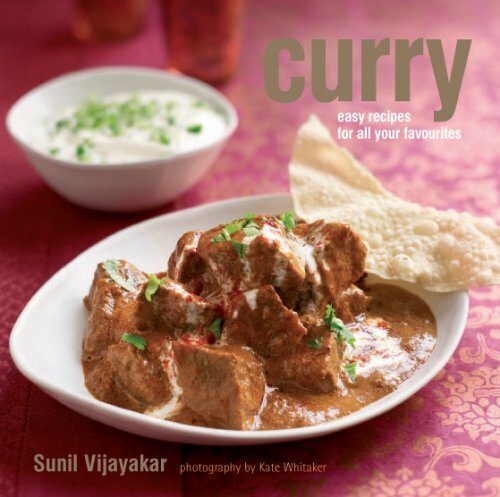 Sunil Vijayakar opens up the world of curries and inspires you to make your own Indian, Thai, and Vietnamese favorites at home. Using fresh, widely available ingredients, Sunil shows how satisfying and simple it is to create authentic dishes and accompaniments in your own kitchen. Chicken curries are some of the most popular; try Chicken Tikka Masala or a fragrant, homemade Thai Green Chicken Curry. With so many Meat curries to pick from, it can be hard to choose, Beef Madras is a fiery dish from southern India, or there's a milder, creamier option, Kolta Curry, which can be made with beef, pork, or lamb and the simplest of ingredients. A Fish chapter gives you lighter delights including Goan Shrimp Curry and Tandoori Fish, Vegetables and Pulses provide spectacular flavor combinations, from Saag Paneer, made with spinach and cheese to Chickpea Masola and substantial curries to please both vegetarians and meat-eaters alike. Finally, Rice and Breads, and Extras are the best accompaniments, Sunil shows you delicious Lemon Rice, Naan, Mango Chutney, and much more. 51 easy recipes for all your favorite Indian, Thai, and Vietnamese curries. Easy curries, every time--from Madras to masala and everything on the side. Includes a list of mail order and online stockists.